[UPDATE]: Today at Volition's PAX panel, the developer revealed a trailer for a standalone Saints Row expansion subtitled Gat Out of Hell for PC, 360, PS3, Xbox One, and PS4. You'll apparently travel to a hellish landscape and don demonic wings. The game will include co-op play where one person can take control of Gat and the other Kinzie. And the game will come in at a budget-friendly $19.95 on January 27, 2015. Volition also announced a port of Saints Row IV for current-gen systems (Xbox One and PS4). The games also launches on January 27, 2015 and will cost $29.99 stand-alone, or you can get it in a bundle with Gat Out of Hell for $49.99. For PC players, an SDK release due out today will introduce customization options to the game, including the ability to create your own weapons. We'll have the full trailer and more details soon! Following the recent posting of a PAX schedule which revealed Saints Row developer Volition will announce its next project today, publisher Deep Silver has published a tease that all but confirms a Saints Row announcement is imminent. The image above--featuring the logo of the Saints Row series' Third Street Saints--was posted to the Deep Silver UK Twitter account this morning, accompanied by the text, "Something wicked this way comes…" It's also proceeded to retweet tweets that suggest this is tease is pointing to Saints Row 5. 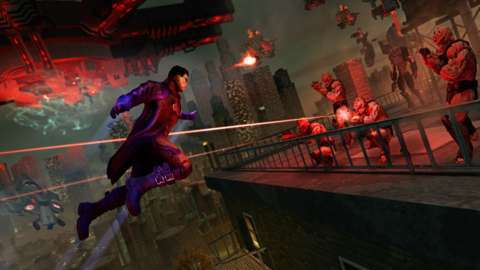 A follow-up to Saints Row IV was inevitable; the only real question now is how it moves on from the style of the previous game, which offered players Crackdown-esque superpowers. Earlier games in the series played more like Grand Theft Auto, though they have increasingly distinguished themselves from GTA. The PAX panel is scheduled to take place today from 10-11 AM Pacific (1-2 PM Eastern). It's explained as being a quiz show with Natalie Lander, who voices Kinzie in the games. "At the end of the panel, we'll show you exclusive gameplay, art, and details for an upcoming project from Volition," the panel's description teases. Stay tuned to GameSpot to find out all the details about what the announcement turns out to be, and check out our PAX hub for all of our coverage straight from Seattle.